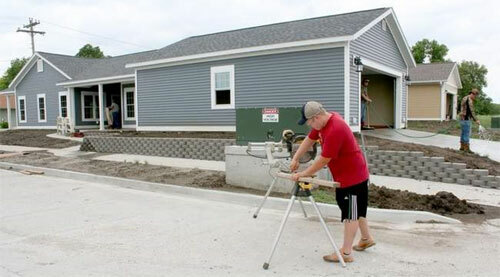 CAPTION: Connor Bonderer, a student of the Building Trades Program at Grand River Technical School, works outside the nearly-finished home at 333 Woodrow Avenue in Chillicothe. An open house for the new home is scheduled for 2 to 7 p.m. Monday, June 3. The Grand River Technical School Building Trades program will host an open house for their newest home next week. The house, located at 333 Woodrow Avenue in Chillicothe, is a ranch-style construction with 1,353 square feet of finished living space and a 667 square foot two-car garage. The inside features two bedrooms and two full baths, an open living/dining room and kitchen, walk-in closet in the master bedroom, custom-made oak cabinets throughout the home and has a 90 percent gas furnace and air conditioning system. The outside of the home is covered with vinyl siding and soffits, as well as vinyl wrapped double-hung windows. The exterior door and garage doors are metal insulated. The house has wet blown cellulose insulation. The garage includes a storm room. The house also features a 13x12 foot covered concrete patio and an 8x32 foot covered front porch. The open house is scheduled from 2 to 7 p.m. Monday, June 3. The GRTS Building Trades program built its first house in 1967 and has built a new home every year since. For the past few years, students of the program have built homes to the specification of the bidding party. GRTS Co-Director Ron Wolf said this is great for the future homeowner, but not necessarily the best method for the instructors and students who build the houses. "When we bid the houses prior to building them, you sometimes get a house that's bigger than you really want to build, or smaller than you want to build, or it's not where you want to build," Wolf explained. At the regular meeting of the Chillicothe R-2 School Board, Wolf recommended the Building Trades program return to building spec houses. These houses would be built to the specifications of the program instructors, allowing them to plan for the size, location and other details of the home that better suit their course plan. "The advantages of the spec house is that our instructors can pick out the plan that fits what they want to teach at the time," Wolf said. "That would include getting location, size and all those things that fit our teaching calendar." The decision to move away from spec houses was made following the inability to sell one of the homes due to poor economic times a few years ago. "We built about 13 in a row, and we had one house out of 13 that was about six months before we got it sold," Wolf explained. "At that time, the district was really broke. At the beginning of that year, we needed to start on a new house, and we were still carrying that old house. The district just didn't feel like they wanted to start throwing more money out when we still hadn't had the other house sold."